The evening of 11 September found Task Force 2 (King) of CCB, at an assembly area a mile northeast of Kettenis (815300), which it had reached after a period of hard fighting. Enemy vehicles were known to be on the left flank, in the vicinity of Walhorn (807321), but as they were trying to escape to the northeast, they did not give the Task Force opposition. As the morning passed, it was learned that the reconnaissance in force sent out by TF 1 (Lovelady) had bogged down in the Eupen Forest about two miles east of the area in which TF 2 was coiled. The Commander of the Combat Command, Col T. E. Boudinot, ordered Lt Col R. H. King to send out a similar reconnaissance in force south through Kettenis (807278) skirting Eupen at Oberstheide (800276), and then moving east through the heavily wooded area via Schoenefeld (823270) and the Raerener Woods to the German border and the town of Roetgen. This force, under the command of Capt. Kenneth T. McGeorge, was composed of 1 platoon of light tanks o£ A Company, 33rd AR, one company of medium tanks, 33rd AR. F Company of the 36th AIR, and one platoon of B Co, 23rd Armd Engrs. At 1500 the reconnaissance in force moved out of the assembly area with the mission of reconnoitering the route into Germany. The thickly wooded terrain east of Eupen made impossible any flank protection. The unit therefore led off with its light tanks, followed next with medium tanks and then the infantry in half-tracks. As the column passed Schoenefeld and continued into the forest, McGeorge noticed a number of tank tracks left by the enemy, but did not encounter any resistance. At approximately 1630, at the crossroad in the center of the forest (862278), the unit encountered teller mines across the road. From a point about 100 yards farther east, machine guns covered the obstacle. For an unexplained reason, the light tank platoon went safely through the well camouflaged mines, and only when a medium tank was disabled by an exploding mine were they discovered at all. The light tanks continued ahead to mop up the machine guns and enemy infantry, which they did without difficulty. The engineers came forward and cleared the eight mines from the cross road. The column thereupon reformed and continued on its mission eastward to the German border. At 1700, the column hit the main road from Raeren to Roetgen (893295), turned southeast, and contacted elements of TF 1 (Lovelady). The reconnaissance in force passed through the friendly units, crossed the German frontier, and at Petergensfeld (903289) turned north on the highway to Schmidthof (895333) at a point just west of the railroad station serving Roetgen. The column moved without opposition along the road, taking incidently, ten prisoners about 600 yards north of Petergensfeld. As the reconnaissance unit turned the bend in the highway at Muensterbildchen (907303), it found itself at the top of a long slope and at the beginning of approximately two miles of perfectly straight road. Perceiving the enemy would have an excellent field of fire if he chose to defend at the high ground at the other end of the straight road, McGeorge halted his force. The ground on either side of the road proved too boggy to deploy armor. Infantry was therefore sent down in columns along the edge of the road to the bottom of the slope, while light tanks were sent ahead to draw fire if the enemy intended to defend at this point. No enemy action was observed, and the rest of the column moved down to the bottom of the slope, while foot troops went on to make reconnaissance on top of the next hill. The point of the column encountered first a rope chain of mines, which enemy infantry had dragged across the road before retiring. The infantry of the reconnaissance unit, F Co, 36th AIR, dismounted, and its half tracks drew off the road. The artillery was called for a preparation on the crest of the Hill at Koenigsberg (902326). The medium tanks, which were sitting along the road, could fire from a column formation, since the slope was sufficient to fire over the turret of the tank ahead. The infantry moved in a squad column along the edges of the road, and by 1800 had reached the crest of the hill without difficulty. Since its mission was to secure the ground beyond the Dragon's Teeth, in order that the engineers could work unhindered on the obstacles. F company therefore continued towards the concrete teeth, some two hundred fifty yards beyond the crest of the hill. However, small arms fire from the right (presumably from a pillbox in the woods) hit the Infantry and stopped it. Since it was now getting dark, F company was ordered to hold on the hill top for the night. Meanwhile, the rest of the reconnaissance in force coiled for the night near the railroad crossing north of Muensterbildchen (907308). When TF 2 (King) resumed its attack at 0800, it found that the enemy had withdrawn from his position on the Koenigsberg hills itself. The engineers therefore removed the mines without difficulty and destroyed the first set of obstacles -- the cables and iron gate. Thereupon the Infantry and tanks occupied Koenigsberg entirely, from which position the unit could see clearly the Dragons Teeth and the obstacles on both sides. The enemy made his presence behind the crust of the Siegfried Line felt by sniper and mortar fire. The reconnaissance unit held the ground about Koenigsberg, while the main body of the TF, which had remained near Kettenis until 1100, began its movement forward. The main column of TF 2 followed the route marked out forlit the reconnaissance in force, and it proceeded without contacting the enemy through the Eupen Forest to Roetgen and thence north along the highway to Koenigsberg. Between 1400 and 1500 the TF coiled near the railroad north of Muensterbildchen (907308), while King, Mills and McGeorge went forward to Koenigsberg to study the situation. It was apparent that F company of the infantry, which was already understrength, could not be expected to secure the commanding ground at Schmidthof on the left and hold the wooded area on the right while the engineers built a crossing of the Dragons Teeth. Therefore, King asked the combat commander for reinforcements. H and I companies of the 36th AIR were taken from Div Reserve and sent forward to TF 2. They arrived at 1800. In the meantime, it was decided to attempt an attack with the infantry on hand. I co, 33rd AR, medium tanks, was brought up as support, while F company, 36th AIR, prepared to attack at 1730. The artillery laid down a ten minute barrage on the enemy positions just previous to the jump off time. F Co., which numbered by now no more than 60 men, turned left of the highway, and moved in platoon column through the woods at Koenigsberg and down a draw which parallels the highway and runs towards Schmidthof. The enemy position behind the irregular line of Dragons Teeth was studded with pillboxes, and foot soldiers were observed digging in around the houses of Schmidthof. The tanks of I company turned west off the highway at the combination restaurant farm house, which is the sole building of Koenigsberg. They skirted the woods and edged around on the side of the slope, some hundred yards from the highway, in order to support the Infantry by fire as it went down the draw towards Schmidthof. The tanks came under AT fire as they moved from the edge of the woods. Two were knocked out. The Infantry, meanwhile, came under small arms fire of the enemy - both from pillboxes on the right flank and from dug in positions in the front. At approximately 1945, as dusk began to settle, the Infantry was halted by the enemy fire. Since it was clear that the Infantry could not seize the objective of Schmidthof before dark, King ordered them to hold their position. The tanks withdrew to behind the crest of the hill. The main body of the TF held its position (907308) for the night. Shortly after midnight, the enemy opened upon the Infantry with mortar and automatic fire of such intensity that the men were pushed back from their position along the slope of the hill (near Mueckenbruch 898331) and withdrew to the Koenigsberg hill. At this position, near the Dragons Teeth, they held for the night. Parenthetically, the antitank fire which knocked out the two tanks of I Co 33rd AR was spotted by the artillery forward observer, which brought down on the enemy position sufficient concentration of fire to insure disabling the guns. The plan of attack developed by King for 0730 in the morning utilized both H and I companies of the 36th AIR. H was instructed to swing left, move through the woods, take advantage of the draw, and attack north towards Schmidthof. I Company was ordered to right of highway, push through the woods, and flank Schmidthof from the east. The actual attack began at 0900, with particularly heavy artillery preparation preceding it. Before the attack was launched, however, King was evacuated, since an old wound had become infected. Mills (Herbert N Mills) assumed command of the task force. The Infantry seized the hill of Schmidthof with very little opposition. The village itself was likewise secured without difficulty. For the most part the pillboxes which had held up the infantry the night before were now empty. From those which were manned, there was captured a mixture of young boys and old men. By 1000 the infantry had secured the ground essential for the engineers to work on the Dragon Teeth. The platoon came forward to fill the crater in front of the teeth, to remove the "I" beams placed in the road at the gap, and to blow the gate locked across the road. Since the crater was full of water it was difficult to fill, the engineers built a bypass at the edge of the road to the left, which passes between the teeth along the sidewalk. Some of the tanks and half tracks were taken through the by-pass, while the engineers continued to work on the crater in order to open the highway for the main body of the task force. Patrols were sent forward from the TF along the road to the bend just south of Friesenrath (904340) in order to reconnoiter the next stream crossing (Inde River). At 1300 they reported the bridge out. They were then ordered to seize the ground beyond the stream to secure a bridgehead for the work of the engineers. By 1400 the 2nd plat, D Co 23rd. Armd Engrs arrived to work on the bridge site. Meanwhile, the tank and Inf began to form a column along the straight section of highway between Koenigsberg and Muensterbildchen in preparation for the advance to the north. At approximately 1500, while the second bridge was still under construction, Mills sent Inf patrols a 1000 yards north along the road to reconnoiter the area. They reported it free of enemy. At the same time, a ford across the stream was found and, initially, the 1st Plat F Co 33rd AR (med tks), was sent across on the road beyond the bridge. As the main body of the column slowly uncoiled and prepared to move forward, the remaining tanks of F Co. forded the stream. By 1630 the bridge was completed and the bulk of the TF began to cross it. By 1715 the Comdrs of the Corps, Div and Combat Command arrived to find most of the TF well on its way again. The leading elements, continuing north on the highway toward Kornelimuenster, spotted a very large gun along the road at Itternberg (907368), which suggested a 105 rifle. At the same time, enemy Inf were seen ducking into nearby hedges. As it was about 1800, and there seemed to be considerable enemy ahead, Mills ordered the tanks to pull off the road into positions of all round protection. From this place (906361) could be sighted a blown railroad viaduct whose debris completely blocked the road. Thereupon Mills pulled ahead in his tank to the brow of the hill at Itternberg (907369). As he turned into a farm lane on the right of the road two German Air Corps Officers, immaculately dressed, came out of the house and surrendered. At the same time the tanks of F Co, which were maneuvering into position along the road, suddenly discovered that they were in the middle of a whole group of dual purpose AT and AA 88 guns, which had been well concealed by the hedges which crisscross the countryside at this point. Simultaneously, the leading elements of the column sighted enemy infantry in and around the hedges and began to fire upon them. On seeing the guns so numerous and and Infantry, Mills ordered I company, 36th AIR, to deploy both sides of the road and clear out the fields. At least eight of the dual purpose guns, in addition to the towed 105 rifle were located in the hedges and fields on this hill. The weapons were brand new, and about the positions were stacked large quantities of ammunition. The guns were so placed as to cover completely the road on which the column had just moved. If the enemy had so desired he could have wiped out the entire company of tanks and inflicted heavy casualties on the infantry in its half-tracks. In short time about 75 prisoners were roundup, and during the next few hours some 25 more were located. Although the reason for the surrender of the enemy without firing his excellently placed and completely equipped weapons cannot be determined, Mills was of the opinion that the heavy artillery concentration which had been laid o6n the hill before the column arrived must have scared and scattered the enemy. The fire had been accurate: there were many casualties. It apparently took all the fight out of the enemy. The remainder of the TF was brought up and directed to coil in the fields on both sides of the highway. Meanwhile, a squad of Infantry was sent across the debris from the viaduct to reconnoiter the bridge ahead. A tank-dozer moved up to begin the job of clearing the blocked road. At 1900 the engineer platoon leader reported that at least three hours would be required to build a bridge on the southern outskirts of Kornelimuenster. Since it would therefore be too late to move farther that night, Mills made preparations to halt the column there until the next day. Major Dunn, commander of H and I of the infantry companies, was ordered to secure the high ground beyond the bridge and at the north of Kornelimuenster, in order that construction work could begin without danger of enemy fire. H company went forward to perform this mission and reported by 2100 that the area was cleared. Meanwhile, in order to speed the start the next day, an attempt was made to ford the stream just west of the bridge site. Six tanks were able to get across, which were used to man road blocks in the town of Kornelimuenster. Patrols of infantry worked ahead northeast of Breinigerheide, and reported that the area was all clear. By 0600 the following morning the bridge construction was completed and the task force could proceed. At 0800 the TF moved off. F company tanks led the column, with I company, Inf, following in half-tracks. Generally, when the column was on the move, a company of medium tanks led the way, followed by a company of Infantry mounted in half tracks. When the situation became obscure, because of the terrain or information concerning the enemy, the infantry dismounted and moved forward to feel out the position. This method proved typical after hitting Germany, while in France and Belgium the reconnaissance platoon led the column, and a section of medium tanks followed behind it. When enemy opposition became stiffer, the reconnaissance platoon leaders were killed and the platoon shot up, hence the change made. The light vehicles, half-tracks and quarter tons, were too vulnerable to small arms fire. Position of the rest of the column: Reconnaissance plat, Bn Hqs, then 1 medium tank co (I), advance battery of artillery, Infantry (H) co, TDs, Engineers, one Bn Hq (33rd), with assault and mortar platoons, medical detachment, maintenance section, F company Infantry, remainder of FA Bn, light tanks (A) co. Anyhow, the column moved out of its bivouac on the hill southeast of Kornelimuenster at 0800. It passed through the city, turned north, and went along what proved to be little more than a good "Texas cow trail" to the right of Busbach. (937404). Enemy were spotted between Dorf (917390) and Busbach (927403). They were fired upon but did not return the fire. The column fired on- pillboxes and enemy vehicles on the left flank all the way as it proceeded to the east and north of Busbach. At 1000 it reached the high ground south of Bauschenberg (938404) and started over the high ground commanding the valley to the north east and the Vicht river. At this point heavy artillery came down from the northeast. The column therefore pulled back behind the crest of the high ground, while the rest of the TF coiled along the route behind it for a distance of three-quarters of a mile. The usual length of the column on the road was one mile; however, it frequently stretched 2 1/2 miles. It was necessary to abandon a section jeeps at this point, as enemy small arms fire from the northwest (934408) drove the men into the ditch and w0uld not permit them to remount and return with their vehicles. The enemy artillery continued to fall on the column but it was apparently unobserved, since it hit the crest in front of the TF and continued to pound that area without searching in any other position. In order to advance farther to the northeast, the TF would. have to descend a steep slope to the valley, cross the Vicht river, and then penetrate the heavily wooded slopes to secure the valley, the bridge, and the commanding ground beyond. H and I companies were given their instructions, and at 1100 I company led off in a column of platoons followed by H company. I crossed over the hill at 938407 and entered the valley near Binsfeldhammer (943409). Small arms fire was received. Several enemy infantry were seen in the woods across the stream (936407). By 1200, the leading elements were almost to the bridge. Friendly artillery laid on three heavy concentrations, based on observation from Brockenberg (938400). Divisional artillery got those on the nose of hill to the left (944413) while Corps artillery was called in to lay on the nose of the hill to the right (936409). The Infantry commanding officer was advised that if the bridge proved to be out, the advance route would be changed and that the task force would swing to rear of TF 1 (Lovelady) and cross over his bridge. The Infantry patrolled up to the bridge (944409) and reported at 1230 that it had been blown and that it would take considerable work to repair it. Thereupon, the plans of the TF were changed, Col Boudinot of CCB told Mills to move his men to the rear of TF Lovelady. Reconnaissance was therefore sent out to find a suitable route of approach to the southeast. TF Mills swung south to hit TF Lovelady at Breinig (934383). It began to move at 1230, and was held up some time near Breinigerberg (946387), where it had contacted TF Lovelady. At 1330 Mills deployed his men off the road in the fields at (934383) and coiled the leading elements (2 cos: F co tanks, and H co Infantry, with TDs and Engrs). The rest remained coiled along the road south of Hassenberg (933394). It remained there during the afternoon, there being no room for additional troops across the stream beyond the bridge. Late in the afternoon the TF pulled near Breinigerberg and went to bivouac in that area for the night. At 1900 Inf of the TF were ordered by Col Boudinot to go up to Col Lovelady at Burgholz (958410) to help secure his position. In order to determine when to move up and what the situation was across the stream, Mills kept close liaison with Capt. George Stalling, executive officer of TF 1 (Lovelady). Mills took one medium tank company and checked personally to see if his force could be assembled north of the Vicht river. He then called Col Boudinot and told him of the crowded situation there and was given permission to move into the bivouac near Breinigerberg. Mills, on his radio, heard Col Boudinot and Lt Col Lovelady discuss the need for Infantry. Lovelady said he did not need the infantry but finally agreed to take them. When Mills ordered the Infantry forward at 1900, he kept F company, Inf, with him, since it was badly shot up. Major Dunn, comdg Officer, 3rd Bn, 36th AIR, thereupon went up personally to contact Col Lovelady and alerted H and I companies. Throughout the entire day, TF Mills remained in place, except for minor shifting of forces. One platoon of tanks (I Co) was sent to CCB to protect the CP. During the night, Mills kept his CP in the pumping station to the right of the road between Breinigerberg (948391) and Nachtigällchen, from which he had withdrawn it the previous night. He pulled his reconnaissance platoon up to the CR for local security. In the morning Mills went up to Col Lovelady's CP, in the pillbox south of Burgholz (958410). There Col Gans was trying to line up his force. He should have had two battalions less one company, but he could only find four companies. Mills told him of the depleted F company which he had held in his area and which he had not sent up the night before because Lovelady had not seemed to need them. Mills then ordered F company commander to alert his men, and ordered him to see Col Gans as to where to put his men. Col Gans should have had F, H and I companies of the 36th AIR (formerly with Mills) and D and E companies of the 36th AIR (formerly with Lovelady). At 0100 of the 16th, Col Gans had been called back to headquarters to receive orders. During the evening of the 16th, Mills received the following order: Move forward, pass through part of Col Lovelady's TF, cut left at RJ 273 (962412), attack west to Stolberg (9342), and then go north through the town, turn northeast at 935434, thence to Birkengang (944438) (incidentally crossing the Donnerburg fortress), then northeast to 954433, then southeast to 957429, then northeast to 959432, resuming the original axis of advance. Mills was to pick up F company 36th AIR from Lovelady at CR 273. In the morning, TF 2 (Mills) uncoiled from its bivouac area near Breinigerberg and pushed its way north along the route (via Nachtigällchen 957400, the bridge 955466 and CR 273) followed by TF Lovelady. F co of tanks, in the lead, crossed the initial point of the engineers bridge at approximately 0800, and at CR 273 the column turned left to penetrate the woods southwest of Diepenlinchen. While passing through TF Lovelady defensive position at the edge of the woods, Mills picked up the remnants of F co, Inf. Just short of the western edge of the woods (954416), the leading elements of the force halted in order to make a reconnaissance and estimate the situation of the open terrain to the front. Across the gentle valley, at a distance of approximately 800 yards, enemy infantry were digging in on the ridge paralleling the edge of the woods (948418 to 958428). Artillery was called for, which came down on the ridge. The 40 men left in F company were dismounted from their half tracks and given the order to attack across the little valley to the ridge and to secure the crest at 952421 as an OP. In addition to the artillery concentration on the ridge in front of the position, artillery also fired on the woods at the southern end (955416), where considerable enemy activity had been observed. Likewise, the orchard at 953419 was subject to fire. When the infantry jumped off about 1000, therefore, they had been preceded by artillery fire which was deemed sufficient to break any enemy resistance. The infantry had crossed the bottom of the small valley in a skirmish line and began to work its way up the far slope. At this point it began to receive small arms fire from the woods to its left end from the direction of a burning house at Neiderhof (958424). The company commander reported that he could not take the objective without undue losses, and he was therefore ordered to withdraw half way back to the woods from which the attack had been launched. Another artillery concentration was then called for. In the meantime, the tanks of the task force had been immobilized by the appearance of a heavy enemy tank (probably a Mk VI) coming up through a small draw behind the ridge to the northeast (955424) and firing upon some friendly light tanks at the northwest corner of the woods near Niederhof (960423). It knocked out a tank of TF Lovelady, which went up in flames and the cry for medics was heard. Mills, after consulting with his tank commanders, thought he could knock out the enemy tank and therefore eased a 76-mm SP gun into position at the edge of the woods. It opened fire on the Mark VI and got off 4 rounds before the enemy tank could turn its turret to fire on the 76-mm gun. Three of these rounds were definite hits, but they merely bounced off. Then the Mark VI opened up and put two rounds right through the front slope plate of the 76-mm tank chassis, knocking out the gun, killing one man, and wounding two others. The enemy tank then remained in position, with no friendly armor able to challenge it. Having no other way to deal with the Mark VI tank, Mills requested artillery fire on its position. Thereafter during the day, whenever the enemy tank poked its nose over the ridge, the artillery would drive it back but could not knock it out. The second artillery barrage was laid down in the woods at 950418, concentrating on the finger of trees which points to Burgholzerhof. Again the Infantry tried to reach the hill, following close in as artillery lifted its fire. This time F company got to the ridge. A platoon of F company tanks infiltrated at maximum speed down the slope and up to a defiladed position in rear of the Infantry. In order to try to complete the mission, a section of medium tanks, commanded by Lt John R Raymond, went up at 1200 with the plan of moving through the woods on the left of 945416. However, as he pushed into the woods he received bazooka fire from the left flank, knocking out the lead tank. In view of the small Infantry force available and the hazards of continuing on the assigned mission, the TF was ordered to hold the ridge. There were only elements of one tank Co and one Inf Co on this objective. The CP was moved to the middle of the woods (956414) while assault guns, mortars and reconnaissance elements moved around the CP. As yet the TD's and Co I of Med Tanks had not been brought up. On this date the TD's, I Co of Med Tanks, Rcn Plat, Assault guns and mortar section were all sent to the right flank of TF Lovelady's position near Krewinkel. They were ordered first to Mausbach, then to turn north on the road to Gressenich. The lost three tanks early in the movement and wound up in the vicinity of Mausbach, between TF Lovelady and the 47th Infantry Regt. During the night, shortly after midnight, the strongpoint on the ridge was subject to an attack by German Inf. Hand to hand fighting ensued, in which two enemy and one American soldier were killed, with others wounded. At 0800 the Inf Comdr reported that he was driven off the high ground and forced back to the farmhouse of Burgholzerhof (953420), under the pressure of heavy mortar and small arms fire. The remnants of F Co were beginning to break under the extended strain, many were shocked and suffering from combat exhaustion. The situation was reported to Col Boudinot, who replied that it was "very necessary" to regain the high ground. By 1000, heavy enemy artillery began to fall on the area. At this time a large number of enemy Infantry were sighted coming over the ridge, which previously had been held by the elements of F Co. Likewise along the ridge to the northeast, enemy began to appear. Thereupon, Mills called for artillery fire on the ridge, which began to break up the attack. By 1500 the enemy efforts ceased. At about 1500, F company again moved out towards the high ground of the ridge, following closely behind a heavy artillery fire. It retook the objective. Mills received no reinforcements and therefore dismounted part of his mortar platoon for flank support on the left. Part of the assault gun platoon was instructed to cover the right flank with fire. Of the six medium tanks available, some were put on the flanks, while others supported the front. This defense was established for the night and was held in the face of continued enemy artillery fire over the entire area. In pursuance of the same mission as he had been given two days previously, Mills was given a different plan of attack. At 0800 he was instructed to turn southwest, move down the small valley instead of across it, proceed to the Vicht river (944410) turn west and skirt the woods in which his tanks had been hit with bazooka fire and move into Stolberg from the southeast. TF 1 (Lovelady) was to follow TF 2.
wooded hill. Sgt Watson, leader of the patrol, returned in his tank and met Mills at 950416. Mills personally reconnoitered for a route leading towards Stolberg, but found none existed without crossing the stream. Since the bridge at this point was blown that was impossible. At the same time as the reconnaissance platoon of tanks moved off, the infantry began its part of the attack. One platoon of I company had been attached to Mills during the night, and along with the rest of F company - which was a ha1f platoon itself by now - it moved down the little valley towards the stream, with the mission of attacking west through the woods (945414) and vicinity. It reached the stream about 0900, meeting very little opposition. Even though the tanks were unable to get through around the hill, the infantry was ordered to attack across the wooded area in the direction of Stolberg. It was to wait for the TF at 940420 in the town. Mills then planned to send his armor over the ridge near Burgholzerhof. As the infantry swung west into the wooded hill, it drew small arms fire from both the front and the rear. It was therefore unable to continue without support. In preparation for the the attack over the ridge to Stolberg, Sgt Watson in charge of the light tanks, conducted a reconnaissance for the TF. From a position in partial defilade near the outskirts of the town (943420), he reported back to Mills. There had been no AT fire as he raced over the hill, and no AT guns were visible. At his position, however, he received enemy rifle and bazooka fire; grenades and machine guns in buildings. He reported by radio also that the ground down the open hill was marshy and that it would be hard to deploy the tanks, but that it was possible to get them through. Mills ordered the 3rd platoon of F company tanks to cross the ridge and join Sgt Watson. As the lead tank moved over the ridge (949419), it drew AT fire and was immediately knocked out. The rest of the platoon then withdrew to behind the hill for cover in the orchard. Sgt Watson, still observing from his advanced position, reported the enemy was shooting out his periscope, shooting bazooka and throwing grenades at close range. He was unable to fire back without exposing himself to the AT fire. Mills therefore decided to lay down a smoke screen to enable Watson to withdraw. However, it became so hot for the sergeant that before the artillery could lay down smoke, he pulled out of his sunken road and ran the gauntlet of enemy fire up over the hill and to safety. Three of his tank commanders were wounded by enemy small arms fire from the town, but during his stay there he had, in addition to making reconnaissance, directed artillery and mortar fire on the enemy in Stolberg. He returned at about 1130. Mills was ordered at noon to hold his present position. At 1500 he was called to Lovelady's CP, where Hogan, Mills and Lovelady were issued the order for a three pronged attack northeast to secure Weissenberg, Hochwegerhof, and the high ground between the two points, The LD was the edge of the woods between Niederhof and Diepenlinchen. Mills was on the left, Lovelady in the center, and Hogan on the right. Soon after the objective was reached, at about 1800, the tanks and Infantry of TF 1 came up from the right. The infantry, elements of H and I companies 36th AIR, were commanded by Capt Getter. They had attempted to move forward, but under heavy fire they had side slipped to the left and reached TF Mills' objective instead of their own. At 1900 Mills put his own infantry (15 men of F co, and 20 men of one platoon of I company) under Getter, telling him to organize the defense for the night. McGeorge, in the meantime, sent to get engineers' platoon to put along the northwest flank on the high ground to the left, and to extend the line farther by the reconnaissance platoon. The CP and assault guns moved up to Niederhof. One platoon of A co, light tanks, remained on the line, while the rest pulled back to Niederhof. This defense was held for the night. Mills sent for his light tank company, his platoon of TDs, and his engineers, and had them contact a guide at CR 273 to lead them into the woods from which the attack was to be launched. His order stated that the tanks or F co would lead, followed by the Infantry platoon and the elements of F company, Inf, (both of which were badly shot up); next the light tanks of A company, with the TDs moving to the edge of the woods to cover the ridge to the west and give flank protection by fire. The mortars and assault guns in position near Burgholzerhof were given the mission of smoking the left flank as Mills attacked. The heavy smoke which they subsequently laid down at 1600 proved very helpful. Mills attacked toward his objective before 1700, where in the orchards and house of Hochwegerhof, he encountered many enemy infantry. AT fire from the northeast and heavy mortar and artillery fire fell on the objective. It was hot as hell. One light tank was knocked out by the AT fire, while Mills and McGeorge roved the area firing on infantry in the orchard and house. The enemy counter-attacked by fire. Mills had the tree immediately in front of his tank blown up by a shell, but the attack was repelled. HE, AP and Smoke were fired into the house, but it was difficult to get the enemy out. Meanwhile, the tanks received bazooka fire from the enemy. There was little order in the fighting. Tanks and Infantry mixed and infiltrated among the enemy. In the morning, Mills received from CCB the order to hold his defensive position at Hochwegerhof and to fan out on both sides of the orchard to protect the left flank of the combat command. About noon Mills went back to the pillbox (958412), which was the CP of the command, located on the east side of Diepenlinchen woods. From Col Boudinot he received an order to attack at 1430 northwest across the ridge and through the valley to Hill 287. At this time Mills had F company (tanks), 32nd AR, and one plat of A Co's light tanks in the orchard at Hochwegerhof, and remnants of Co F 36th AIR, now numbering about 15 men . When Mills pulled his tanks back, however, the platoon of I Co, Inf, and Co, Inf. remained with H company in the area. Mills asked for the return of his I Co tanks, which had been sent to Mausbach the night before to hold the town. In order that this company might arrive, the attack was held up from 1430 to approximately 1600. During the hour and a half, while the Task Force was preparing for the assault, an unusually heavy enemy artillery barrage came down on the western edge of the Diepenlinchen woods. It came from the northwest, in the direction of Hill 287, and disrupted the refueling and reloading of ammunition of the Task Force. Further disruption was caused by the casualty of Capt John Watson, artillery Officer, and his FO, who had just worked out the fire plan for the artillery. When the armor of the TF was finally marshalled for the attack, F Co had 8 tanks, I Co 6 tanks and A Co 15 light tanks. 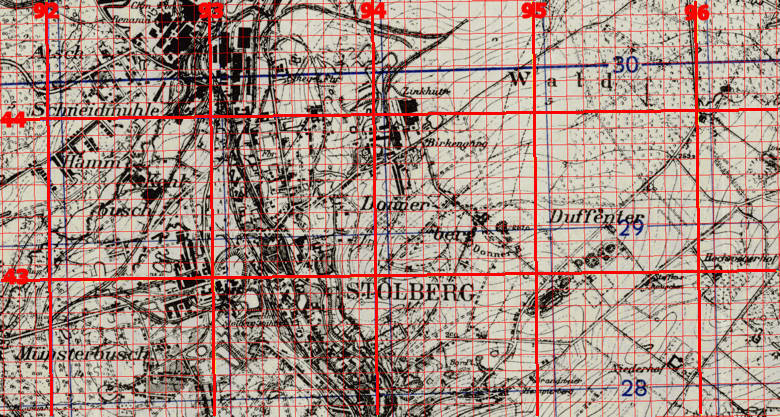 As artillery preparation, concentrations were laid on Duffenter (953430) on the right, Donnerberg (946424) on the left, and Hill 287 (948433) in the center. The assault guns of the Bn laid smoke on the hill itself, while the artillery smoked the right flank (957434), and mortars smoked the left (947424). The TF had hoped to receive Infantry support in its attack and it was promised that troops would he sent up later in the afternoon. When the attack was launched at 1600, the armor went without infantry support. F co and I co led in lines of five tanks, making a total of three waves, and A co followed. As the tanks crossed the ridge before going down the valley at Duffenter, they opened up with their guns on Hill 287. As the attack advanced under the protection of smoke, the tanks would run and fire, combining speed with fire power as much as possible. One tank commander of a light tank was wounded and his tank turned back. Otherwise, the attack through the crossroads south of Duffenter and up to the top of Hill 287 was made without loss of vehicles. Only the smoke and speed saved the TF, for direct 88mm fire had been coning throughout the afternoon; probably from a Panzer VI (Tiger I) tank known to be in the area. Another reason for the success of the initial attack was the action of the TD platoon, 1st Plat. B co, 703d TD Bn, which had been in partial defilade behind the right flank of the force with fire and put fire on enemy vehicles observed in the vicinity of Hill 287. It did an excellent Job, knocking out one Panzer VI, tank on the right flank and one Panzer V (Panther) tank near Hill 287. The TF reached the top of the hill (Hill 287) before 1700. Then the leading elements got to the top of the slope, they drew fire from the rear of the hill before they could take cover. Seven tanks were knocked out rapidly - 3 from I co and 4 from F. Thereupon, the remainder withdrew to the near side of the slope and began to form a defensive position southwest of Duffenter. (947426) as marked on sketch. The light tank co was given the task of protecting the flanks and rear of the force, since without infantry, the task force was open from all sides. Mills then organized the defensive position for the night, under fire from enemy Infantry in the houses in Donnerberg on the left, around the church, and from positions on Hill 287. It necessitated a withdrawal of about 200 yards on the right and 400 yards on the left. Meanwhile, the rear CP of the TF and higher Hqs were trying to get infantry to outpost the position of the TF. After making frantic efforts, they report at about 1900 that none were available. To make things worse, the enemy began to bring his artillery fire into the area. Observation for the enemy was available from the pillbox on Hill 287, and for forty five minutes the TF received some of the most intensive fire of the past several days. Afterwards, the enemy contented himself with intermittent fire of high velocity into the area. The medics half-track tried several times to get up to the position, but each of the efforts were met by enemy fire from Hill 287. Throughout the night, the tankers dismounted to guard their vehicles, and by good luck the casualties were low. At dawn one of the remaining tanks of I Co was hit by bazooka fire. It was knocked out and its commander badly injured. New efforts to get infantry and medic aid were made. About 1030 Lt Paul R Long led the medical H/T over the hill in a light tank. At the same time urgent requests for air support were made. One flight came in but had to return for gas. Others contacted already had missions. A third effort brought a flight which stated that the desired targets (marked by red smoke from the artillery) were too close to friendly vehicles. Therefore, the enemy fire, particularly from a dug in tank on Hill 287, continued to harass the TF. One Inf Plat, so fresh that some of its men had done little more than fire their M-1 rifles, from the newly reconstituted E Co 36th AIR, was reported coming up to aid Mills. MG fire from the enemy in houses at Duffenter pinned the platoon down. An artillery concentration and then finally a smoke screen was laid down to get the men forward by 1400. At 1500 they were ordered to move out toward Hill 287, to dig in and outpost the position. The Plat Leader was wounded and the platoon bogged down short of its line in the vicinity of 947429. At about 1530 Mills received radio order from the Combat Commander to undertake a new mission. He was ordered to move northwest along the road across Donnerberg to Birkengang, thence to go southwest and make contact with TF Hogan in Stolberg. Mills gave his attack order and the infantry were withdrawn to the tank position, to be mounted on the rear for the attack. Just as Lt Col Lovelady came forward with part of his TF to relieve Mills so that he could attack, the enemy joined in with a terrific artillery barrage, which scattered part of the infantry. Mills took off towards the objective with 4 tanks left in F co, 3 in I company, and 14 in A company of light tanks. Instead of striking across the road suggested by higher headquarters, Mills took the circuitous path in order to secure as much cover as possible. (see dotted line on map 945430 to 940430 to CR at 945434 and then NW to Birkengang). As the TF proceeded to its objective, an enemy tank from west across the valley opened up on its left flank, forcing two light tanks to take cover. They then became stuck in the mud. As the column turned northwest on the road to Birkengang (944436) enemy to the north of Hill 287 opened up on the column from the rear. Then as the TF made another turn southwest of Stolberg, it began to get direct Tank fire from the enemy behind bunkers (936438). Likewise, time was passing and Mills had to start coiling his force for defense during the night. He therefore turned the column into the factory district of Birkengang, and by stringing the column along zinc slag piles he succeeded in giving it some cover against tank fire, if not from infantry small arms. One section of light tanks was sent back to get supplies. It reached the CP in Burgholzerhof, got supplied, and attempted to return, where about 2000 it was to pick up tanks from TF 1 near Duffenter. They got to 942433, where an enemy tank confronted them. As a result of the nights efforts, three half-tracks, three medium tanks, and one light tank were lost to enemy fire or stuck in the mud. The TF remained in the Birkengang factory area (942438) most of the day. Enemy tanks were heard early in the morning moving to the northwest at a distance estimated to be about 500 to 1000 yards. Other enemy vehicles were heard in the woods to the east and along the road from Birkengang toward Hill 287, About 0800 a German SP gun pulled up on top of the slag piles (944438) about 50 yards from the nearest tank of the TF. A bazooka was fired without hitting the enemy; however, the vehicle withdrew. The tanks of the force were themselves unable to fire against the enemy and remained in cover, since they were pulled in close to the rough edge of the slag pile of the zinc factory. About 1000 a tank pulled up to the southeast corner of the CR at Birkengang (943438), not such more than 100 yards from the factory area. It sat there, as if guarding the enemy infantry who began to infiltrate towards the TF from the direction of Eschweiler Wald. The Infantry and the crews of the TF fired upon the enemy with rifles and machine guns and managed to kill a number of them. In addition, Mills called in frequent artillery concentrations which apparently proved effective in breaking up the enemy groups. All through the morning the enemy brought down heavy artillery fire in the general vicinity of Hill 287. It passed over the head of the TF as it was coiled in the factory in Birkengang. It seemed probable that the enemy, from his observation point near Donnerberg, could not see Mill's force, for the terrain was such that fire into the TF from the northwest would have been easy. Late in the morning, a patrol of the remaining 14 Infantrymen were sent out towards a building north-west of the position at 939437, where enemy infantry had been sighted. The patrol returned with four prisoners who stated that beyond the high slag pile west of the factory (938439) were between 200 and 300 dug in infantry. At this time friendly artillery from somewhere west of Stolberg, apparently on commanding ground held by CCA, laid down fire upon the enemy that was threatening Mills force from that direction. At 1500 the enemy on the west of Stolberg apparently sighted the Task Force, for heavy calibre high velocity shells began to fall on its position. At the same time, enemy infantry began to infiltrate into the houses southwest of the zinc factory (939437). In the face of enemy capabilities against the TF, Mills called Col Boudinot, CCB commander, on the radio and discussed the situation. Mills was given authority to plan a means of withdrawal to contact TF Hogan in Stolberg itself. At this time Mills lacked Infantry to hold such a position, while many of his men required medical treatment. Some of the tanks were low on ammunition. While a few of the light tanks needed fuel, since the enemy artillery had disrupted the refueling before the attack. At 1615 the artillery laid down the smoke screen as planned. In spite of the great assistance this gave the maneuver, the TF still received tank fire from 944436, along the edge of the woods, and from 944438, the crossroads at Birkengang. The tank southwest of the factory area, at 939437, could fire only part of the time, for the column moved down a draw which partly masked its fire. At the moment the artillery laid its smoke screen, the enemy infantry sprang up from its position on the outer edges of the slag piles and closed in on the Task Force. Enemy fire was received at almost point blank range. Apparently the enemy had been building up his strength for some time, and he either used the smoke to cover his movements or he foresaw that it preceded a withdrawal. That not a man was hit during the actual withdrawal operations appeared to be a miracle to the Task Force Commander. The column moved out at full speed just after 1615, and by 1630 initial contact was made with TF Hogan in Stolberg (937432). In the evening Mills furnished road blocks for Hogan's force. This position was held in Stolberg during these days. At the end of the period 23 through 25 Sep 44 the Task Force was relieved by part of the 32nd AR.